As one of South Korea's Natural Heritage sites is on the verge of being replaced by a pile of cement from naval base construction work, local residents and civic activists are waging a fierce battle to rescue the site. The opposition stress that the naval base construction will not only turn one of the nation's most treasured site into a cement tomb, but the launching of a naval base on the island also could jeopardize the Korean peninsula's peace. More and more South Korean Tweeters and bloggers are joining the movement. Jeju Island is the country's largest, most visited island, situated at the southwest of the Korean Peninsula. It was named a Natural World Heritage Site because of its volcanic islets and its lava tubes which are worth preserving. GangJeong Village, Jeju Island. Image by Cafe Peacekj (cafe.daum.net/peacekj), used with permission. The island is well-preserved, free of contamination and disease from the mainland. 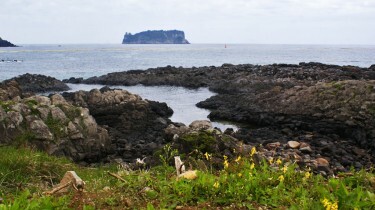 Jeju is a designated Biosphere Reserve by UNESCO. 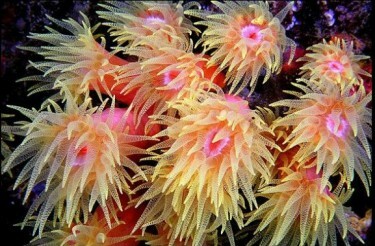 It is also a Marine Reserve zone selected by the Korean Ministry of Maritime Affairs and Fisheries. Local residents and activists are particularly concerned about the Gureombi Rock in the Jeju island's GangJeong village. The Gureombi is a collection of broad lava-formed rocks and stones spread over the seashore, a geographically important structure and home to numerous endangered species. The ongoing conflict, between the protesters on one side and the Navy and the concerned government departments on the other, goes back three years. 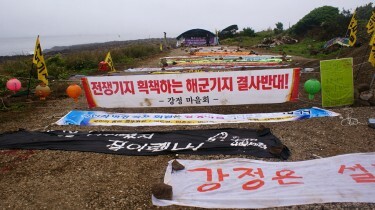 Starting from May 2007 when the final decision was made to select GangJeong as the construction site for a naval base, local residents started protests and activists have arrived on the island to help them fight a lonely battle. On December 2010, 32 protesters and two local residents were arrested for attempting to disrupt the Navy's ground-breaking ceremony for the naval base. Activists Protesting against Naval Base Construction. Image by Cafe Peacekj(cafe.daum.net/peacekj), used with permission. More activists and citizens started joining the protest from March 2011 and it has gathered strength in the Twittersphere. Apart from the Protect GangJeong homepage [ko], the Protect GangJeong Facebook page [ko] was set up and two Tweeters (@kimseriiii and @thinkunit) are live-tweeting about the protest from Jeju. The project even has a Protect GangJeong Facebook badge [ko] where Facebook users can get a GangJeong badge to attach to their profile image. In late May, celebrated American linguist and activist Noam Chomsky, responding to an email sent by a Jeju activist group, wrote that he found it “very disturbing to hear” about the “ominous plans for the huge naval base”. (Full content of Chomsky's email). Forty-four various organizations and groups across the nation have agreed to form a coalition protesting against the naval base construction in Jeju. We welcome this news with open arms. 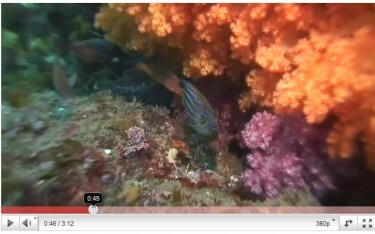 Coral Reef in GangJeong Sea. Image by Kim Se-ri, used with permission. 구럼비해안과 범섬 사이에는 세계적으로도 몇 안되는 색색가지 연산호 군락지여서 유네스코가 생물권보전지역으로 지정한 곳입니다. 제주 해군기지 예정지내에는 제주특별자치도 조례로 절대보전지역으로 설정되었으며 육상은 대규모 역사유물 산포지로 둘러싸여 있으며 멸종위기 동물[…] 등이 대규모로 서식하는 곳입니다.국방부,해군이 강정마을 해안에 건설하겠다고 한 해군기지의 규모는 총 12만평 면적을 매립하는 것으로 이는 […] 제주역사(役事)이래의 최대 해안 매립공사입니다. The area starting from the Gureombi shore and the Bum islet is a UNESCO designated Biosphere Reserve because it is a habitat of various coral reefs. This planned construction site is also a designated Absolute Preservation Zone according to the Jeju Municipal Ordinance. On the land, historical artifacts are buried en masse and (the under the sea area) is a natural habitat of endangered species. […] The Ministry of National Defense and the Navy plan to build a naval base on GangJeong's shore. The area they want to reclaim is about 120 thousand square pyeong (near 40 square hectares) in total – which would be the biggest land reclamation work in Jeju's construction history. 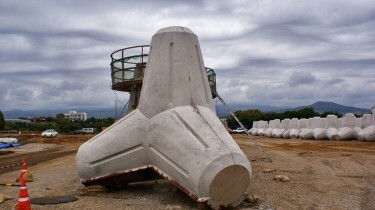 GangJeong construction site. Image by Cafe Peacekj (cafe.daum.net/peacekj), used with permission. It is important to remember that the U.S. Navy will be porting Aegis destroyers (outfitted with “missile defense” systems) at this base. The proximity of the base on Jeju Island to China's shipping lanes, that they use to import 80% of their oil, is no coincidence. It is beyond obvious that this base is absolutely going to contribute to further militarization of the Asian-Pacific region and will in fact be a dangerous trigger for war. Under the Gangjeong Sea. 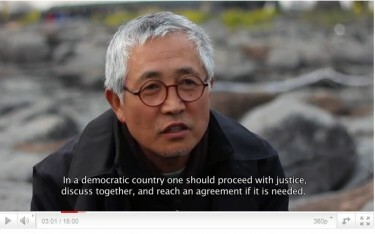 Video taken by filmmaker Yang Dong-Kyu, uploaded by Luciaschoi to YouTube. [Video Taken in Undersea World] The UNESCO-designated Biosphere Reserve and also one of the Absolute Preservation Areas selected by the Korean Ministry of Environment: ‘Jungduck shore of GangJeong Village’. Curious about how this place would look like under the water? Click http://bit.ly/k5bur2. Yang Interview with English subtitles. Uploaded by LandofStone to YouTube. [Video] Yang is on the 57th day of hunger strike. Movie critique Yang Yoon-mo spoke about the major talking points on the Jeju naval base. The title of the video is the Island of Stone. 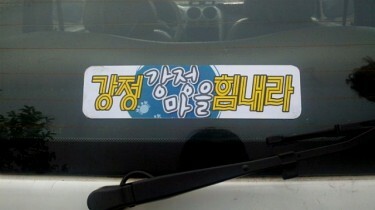 A sticker which reads "Go GangJeong!". 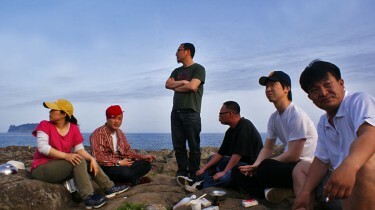 Image by @ilgangjeong, posted on Cafe Peacekj, used with permission. [Let us Protect GangJeong Village all togheter] Contact @kimseriiii to write down your signature to scrap the plan. Contact @thinkunit to order a banner. Contact @ilgangjeong to get car stickers. There are a few local residents actually siding with the construction of the naval base. South Korea's progressive newspaper, Hankyoreh pointed out [ko] that some residents are too tired of the continuing conflicts which have almost ruined their daily lives. Another key member of the movement @thinkunit admitted in a tweet [ko] that some local taxi drivers were positive towards the construction plan for the financial benefit the naval base will bring. Banners at the entrance of construction site, Gangjeong, Jeju Island. Image by Cafe PeaceKJ (cafe.daum.net/peacekj), used with permission. The Ministry of National Defense stressed that Gangjeong village of Jeju is a strategically perfect spot for the Navy to secure the nation's economic efficiency. However, activists, such as a movie director Park Sung-mi (@sungmi1), stressed in her tweet [ko] that the Defense Ministry had publicly withdrawn their “Ocean Navy Strategy” which has served as justification for pressing through the construction plan against the resident's wishes in the first place. Based on the facts presented in this piece, I am against the construction of the naval base – the damage to the ecosystem will be around far longer than the current geopolitical situation. I grew up in a city which is *still* dealing with the environmental damage caused by a navy base which lasted mere decades. However, I strongly disagree with the statement “It is beyond obvious that this base is absolutely going to contribute to further militarization of the Asian-Pacific region and will in fact be a dangerous trigger for war.” No. Without a strong counter military presence, China will invade or force a “voluntary” union with Taiwan, gaining a strategic position which could be used to control much of the trade in that part of the world as well as being a perfect site to launch attacks into Japan and the Phillipines. Given the history of China first invading Tibet, and then laying claim to parts of India, it’s clear that when they get some territory, they will just want more, and if Taiwan goes, then it will be very difficult for anyone to stop Chinese territorial expansion (not to mention that most people in Taiwan do not want union with China, and I think they are the only people who have a right to decide on the matter). In fact, China has already made claims on parts of Japanese territory. The only thing which can keep China in check is a military presence strong enough to make any military adventure futile. The only military in the world that can do that is the military of the USA. A U.S. military presence which is clearly capable of helping its allies would decrease, not increase, the likelihood of war. If Mr. Gagnon wants to reduce militarisation in East Asia, he should be trying to get China to stop pointing missiles at Taiwan. They we could talk about reducing the U.S. military presence in East Asia, which unlike the Chinese missiles pointed at Taiwan, are not currently oriented for invasion. I apologise for the length of this reply, and for being a bit off-topic. I currently live in Taiwan, so the issue of whether or not China is going to invade is important to my personal safety. I agree with “Sara” regarding Bruce K. Gagnon’s usual anti-US rhetoric, which is a real load of rot. The more immediate concerns about this base are how such a base would affect the area in terms of pollution, especially considering the South Korean Government’s long-term terrible record of spoiling so much of their land and habitat through mismanagement and incompetence.